When a site owner implements structured data for rich snippet features in the search results, and then those rich snippets do not show up in the search results, the next step is to figure out why that is. First, when a site owner implements structured data, they should run it through the Structured Data Testing Tool to ensure that the markup is implemented correctly. Once Google has crawled the pages with the markup, theoretically, the rich snippets should begin to appear in the search results as long as it is implemented correctly and it is acceptable from a policy standpoint. If they still do not show up, it is usually a page quality issue as to why the markup isn’t being shown. John Mueller from Google, in yesterday’s Webmaster Office Hours, had a tip to help webmasters figure out if it is a quality issue preventing rich snippets from displaying in the search results. Usually if you do a site query for a site, we will show the rich snippets, if it’s implemented technically correct. So that’s a good way to kind of double check that we can pick up the markup properly. And we’re not showing it in normal search results, then that’s really a sign that we’re essentially not sure about the quality of the website. 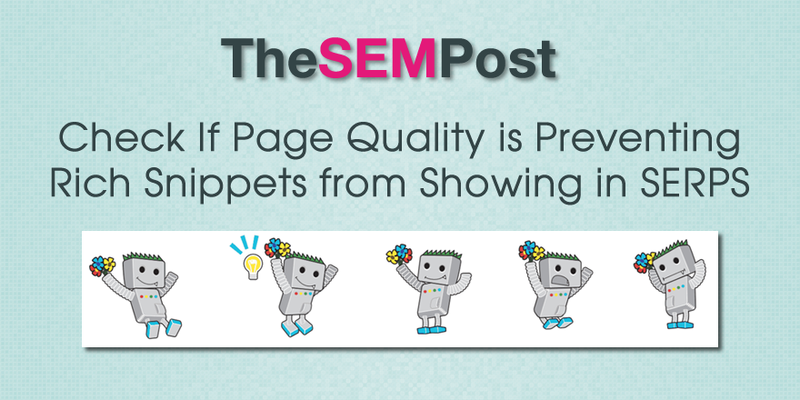 He also continues to talk about page quality, and specifically Panda tips on improving page quality. He also recommends not taking your own word about your own site being awesome, but get feedback from those not directly connected to the site. It is also worth noting that it seems to be on a page by page basis. You might see rating/review stars for some pages but not others. Or you might only see some rich snippet features showing up but not others – for example you might see product pricing but not reviews, or vice versa. But if you want a quick health check for your rich snippets, showing rich snippets with a site: query, but not when searching for keywords, is a sign you need to increase the quality of the pages… and that will benefit your pages and site well beyond just for rich snippet reasons.